America’s roads have, over the past three years, become steadily deadlier for pedestrians, cyclists, and drivers alike. Many new technologies exist that hold the potential to reduce the likelihood of a serious or fatal crash. While more passenger vehicles come with these systems installed, large commercial trucks rarely make use of these powerful tools. Safety experts are calling on shipping carriers and other businesses with large commercial fleets to install crash-avoidance systems on their trucks. Read on to learn more about the life-saving potential of using crash-avoidance systems in commercial tractor-trailers and big rigs, and contact a seasoned Idaho personal injury lawyer for help after a large truck crash. Studies have found that crash-prevention technologies hold great potential to make crashes less likely to occur, and less severe when they do. The Insurance Institute for Highway Safety believes that some 107,000 crashes could be prevented altogether or made less serious if vehicles had crash prevention systems such as front-crash warning, lane-departure warning, and automatic emergency braking systems. Jake Fisher, the head of auto testing at Consumer Reports, explained that, while all vehicles would be made safer with the use of crash-prevention technologies, “it’s more important that these advanced driver aids come standard on trucks than on cars. Tractor trailer trucks can weigh up to 80,000 pounds, and the consequences of a crash—no matter who is at fault—can be devastating.” For example, many dangerous crashes involving tractor trailers occur when the trucks are unable to see a passenger vehicle located in one of the trucks many large blind spots. Nevertheless, blind-spot warning systems are not mandatory in large trucks, and indeed they are found on few commercial trucks. More and more new passenger vehicles are coming equipped with safety technologies, but according to Securing America’s Future Energy, a safety think tank, only about 15% of all large commercial truck fleets in the US come with such crash avoidance systems installed. Some trucking and shipping companies with large commercial truck fleets, such as UPS, have been adding safety technologies to their trucks, as well as purchasing new trucks with these technologies pre-installed. About 45% of the UPS fleet of delivery trucks now uses some form of crash-avoidance system. 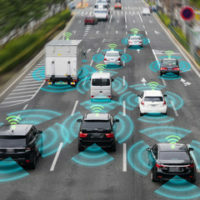 As these features grow in popularity and their effectiveness is proven, more carriers may make use of crash-avoidance systems to prevent unnecessary loss of life and health. For skilled, dedicated, and effective legal help after an Idaho truck accident, contact the Twin Falls personal injury lawyers at Pedersen & Whitehead at 208-734-2552, and in Boise at 208-336-2552.